You buy goods online, you work online, you get your news online, so why not get new staff online? We look at some of the key places to advertise on the internet and offer some basic advice on recruitment on the web, and the good news is that many of the places to advertise are free. Why advertise a job online? The traditional way of attracting new talent to your business was through the local press, however while that may still provide some good candidates, it won't get you the best. It may not even get you in front of all the ideal candidates in your area. Ask yourself this "Do you read the local press?" If you don't then how do you expect to attract the right stuff through a local advert? 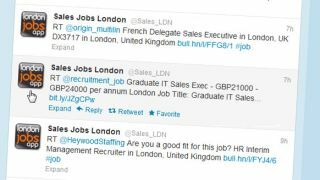 By using the internet you widen your scope to recruit from candidates around the UK and the World, and it doesn't need to be complicated or expensive. One of the most effective places for recruiting is your own website. Your customers are a good pool to recruit from – they already know your business and like your products, and the only costs involved are the time it takes to add a jobs section to your site. If you have a Facebook site or LinkedIn group then you should also advertise the job position there, as many potential candidates may only view your Facebook and LinkedIn pages and never come to your main website. LinkedIn is one of the largest business networks and is a great place to find new staff. There are several ways to recruit on LinkedIn, you can go through the jobs part of the site and post a job online. Or you can use your networks to widen your scope and find potential candidates using other people's contacts and approach potential employees directly. Your network is the best place to begin raising awareness about your jobs – that's where you'll find your strongest referrals. Your connections might be interested in the job themselves, or they may know some good candidates. Use LinkedIn status updates to tell your network about open positions, and add a link to the post itself. As well as your own pages, LinkedIn interest groups are also a good place to advertise. Look at the professional groups that cater for your industry, as well as the groups that cater for the particular sector you're interested in. For example, if you're looking for a sales person for your publishing business then look at both the sales groups and any publishing elated groups. Be careful you don't jump into every relevant group to put up a job advert. That will be viewed as spam and do nothing for your business reputation, and could even be enough to get you banned from some groups. So make sure that the group is appropriate, and that you follow any guidelines on recruiting on that group – most are happy to allow job adverts, but others only want jobs in certain parts of the group or on specific job boards. If in doubt contact the group owner. Twitter is a quick way to get your message out to all your followers and on to the wider world. Unfortunately most jobs can't be described in the 140 characters available on Twitter, so try to get as many details in as you can and add a short link through something like Is.gd Is.gd or Owly ow.ly or Google goo.gl to the full job description on your website.